Finally the day is here when I share the third and last in Anita Goa’s and my three part cooking series on youtube. We’ve done breakfast as well as lunch/dinner but the series would not be complete without dessert so here it is. 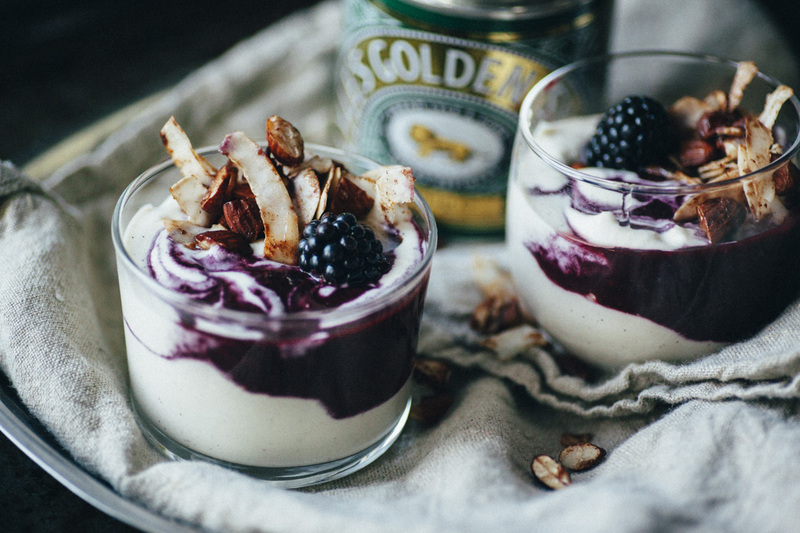 A creamy cashew cream pudding with blackberries and a crunchy cinnamon and maple syrup topping. Can’t go wrong with either three I think. In this dessert you get creamy, berries and crunch all in one little pot. As always I use whole foods for my recipe and for sweetness I mainly use rice syrup in this recipe except for the crunchy topping where I add maple syrup to get that lovely maple flavour. 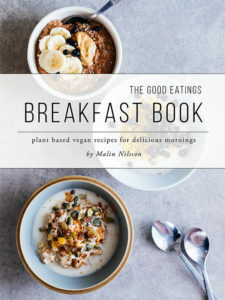 During my whole foods macrobiotics course I learned about the alternatives to refined sugars and how they’re not necessarily that much better for us just because they are not granulated and white. Therefore brown rice syrup has become my new confidant in most things sweet. Made from a naturally sweet whole food without to much processing it releases slower into the blood stream than for example agave syrup so if you haven’t tried it yet go get it! I haven’t shared that many desserts on the blog as of yet and I would love to hear if you’d like more of them? Or what you like to see and read in general? Your comments are a great inspiration so don’t be shy, let me know what you think. Feel free to ask me anything as well (at least almost anything, haha). And lastly if you didn’t read the last posts of ‘Cooking with Anita’ then you might wonder who this lovely lady is. And I’d love to tell you; Anita is a fitness and yoga instructor with roots in Norway and the United States who is now based here in London. She teaches at The Life Centre in Islington but you can always find her online as she shares great videos on youtube teaching various yoga flows. If you’re interested in learning more about my new found yogi friend you can check out her website here or go straight to her youtube channel right here. Now, go make some dessert and treat yourself to completely enjoy it in peace and calm or in good company! Soak cashew nuts over night or during your working day (roughly 8 hours). If you don’t have time for this simply soak the cashews in boiling water for at least 20 min, this will however make your base warm so you will need to chill it before serving. Place a little oil in a frying pan over low-medium heat and add pecan halves, cinnamon and maple syrup. Ones they are starting to brown a little and are fragrant add coconut chips and let fry for another minute. Take off heat and set aside. Mix all creamy cashew ingredients in a blender until smooth. Set aside. Mash half of the blackberries with the ginger and brown rice syrup and add quartered berries and mix. Reserve two berries for garnish. 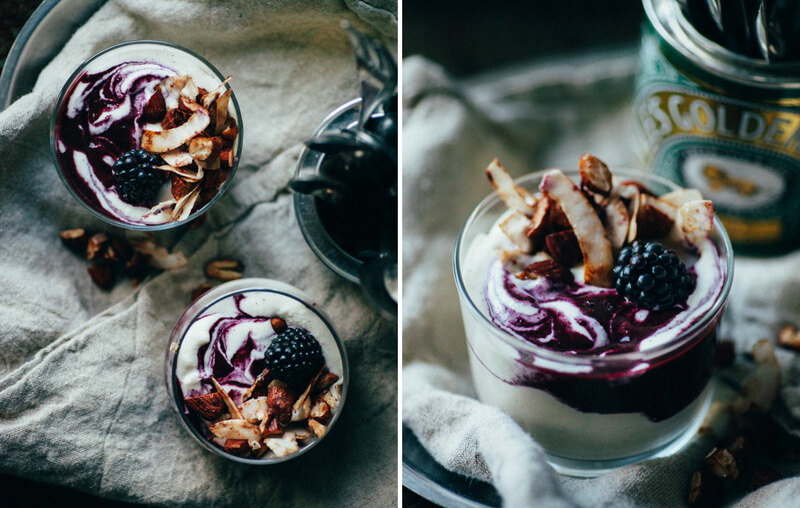 Layer creamy cashew mixture with your blackberry mixture. Make some swirls using the handle of a teaspoon. Top with maple nuts and garnish with a whole blackberry.